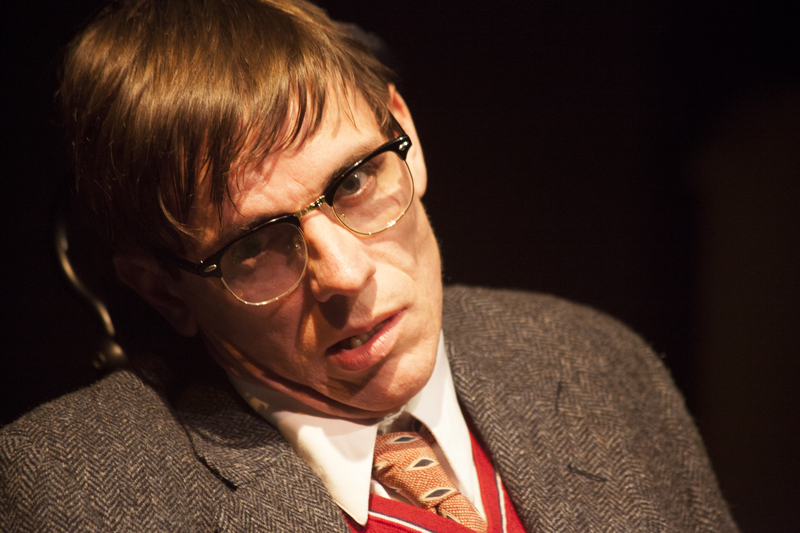 Alan Coyne is Stephen Hawking in Indra’s Net Theater’s world premiere production of “A Time for Hawking” written and directed by Bruce Coughran. Photo Credit: Indra’s Net Theater. Indra’s Net Theater specializes in plays about science, usually original work, often from the hand of playwright/director Bruce Coughran. They consistently offer some of the best and most intellectually challenging theatre to be found in the Bay Area, and “A Time for Hawking” is no exception. Playwright/director Bruce Coughran combines a poet’s gift for language with the insight of a scientist and the instincts of a showman. It is a tremendous trifecta, well displayed in this production. Young Stephen Hawking was a gifted graduate student at Cambridge University, filled to the brim with potential and ambition, when he was diagnosed with Amyotrophic Lateral Sclerosis (Lou Gehrig’s disease) and advised that he would likely not survive two years. Of course, as we know, he did survive, and thrive. Playwright Coughran reminds us of that fact by having an older, wheel-chair bound Hawking (the excellent Alan Coyne) introduce the play, telling us that we will be seeing an important night from his youth, shortly after his diagnosis, when he attended a New Year’s Eve party at which he would encounter a life changing event. Rising from his chair, he drops 30 years of aging and disease, to present himself as a very young man, handsome, graceful, at the brink of his career, but harboring a tragic secret. 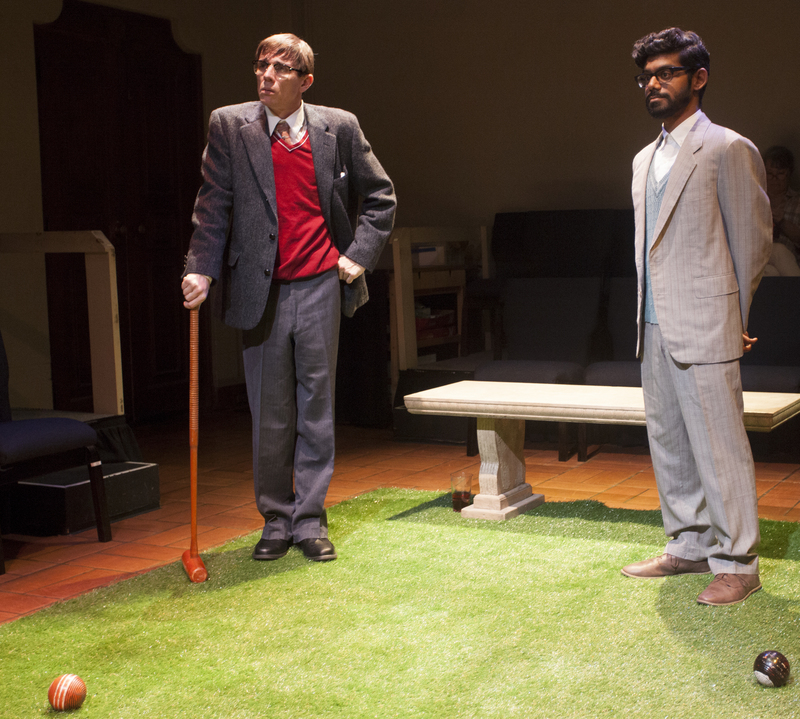 Jayant Narlikar (Tirumari Jothi) and Stephen Hawking (Alan Coyne) are student colleagues in ‘A Time for Hawking.’ Photo Credit: Indra’s Net Theater. 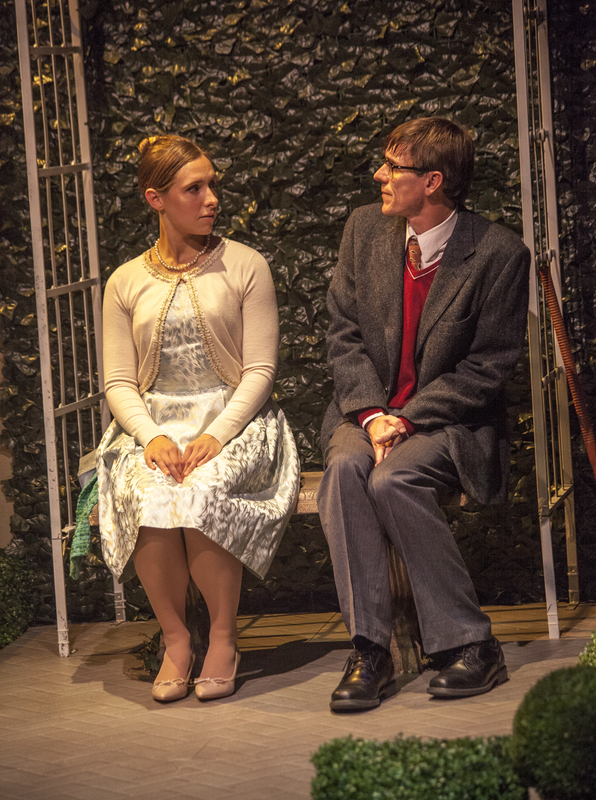 We find ourselves in a garden outside an upscale suburban London home where Hawking and his close friend, fellow graduate physicist Jayant Narlikar (played with great charm by Tirumari Jothi) are getting drunk while hiding out from the crowd. Alan Coyne as Stephen and Adrian Deane as Jane establish rapport in Indra’s Net Theater’s world premier of ‘A Time for Hawking’ at the Berkeley City Club. Photo Credit: Indra’s Net Theater. They are shortly joined by Jane Wilde (Adrian Deane), a friend of their hostess, and former schoolmate of Stephen’s. Learning that the two young men are physicists, she confesses to being a student of poetry with little grasp of science, and invites them to explain their work. Not indifferent to her charms, the two young men eagerly comply. What follows is an astonishing lesson in 20th century physics, dancing about the General Theory of Relativity, the Big Bang, Quantum Mechanics, and other difficult subjects. The theme that holds it altogether is the relativity of Time and Space. As the two scientists compete with one another to charm their lady with their mansplaining skills, she pushes back with her own metaphorical explorations, drawing upon her studies in Spanish poetry, making fine use of her knowledge of Lorca. During the discussion, it becomes increasingy clear that Stephen and Jane are developing an exceptional rapport, eventually sending the third wheel that is Jarlikar off to party land so they may commune alone. Stephen confides in Jane about his medical condition and imminent death, and she inspires him to seize the moment since, after all, time is relative. Since we know from the start that Stephen will survive, the ending does not surprise, but it doesn’t matter. Excellent writing and emotionally acute acting keep us engaged, moved, and educated during this extraordinary evening of theatre. ‘A Time for Hawking’ continues at The Berkeley City Club through January 13. For further information, click here. “A Time for Hawking” by Bruce Coughran, world premire produced by Indra’s Net Theater. Director: Bruce Coughran. Lighting Design: Jim Cave. Composer/Sound Design: Chris Houston. Set Design: Sarah Phykitt. Costume Design: Lisa Claybaugh. Stephen Hawking: Alan Coyne. Jane Wilde: Adrian Deane. Jayant Narlikar: Tirumari Jothi. 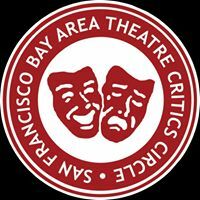 Posted in Reviews.Tagged A Time for Hawking, Adrian Deane, AlanCoyne, berkeley city club, Bruce Coughran, Charles Kruger, Indra's Net Theater, Jane Wilde, Jayant Narlikar, San Francisco bay area theater reviews, Stephen Hawking, theatrestorm, Tirumari Jothi.